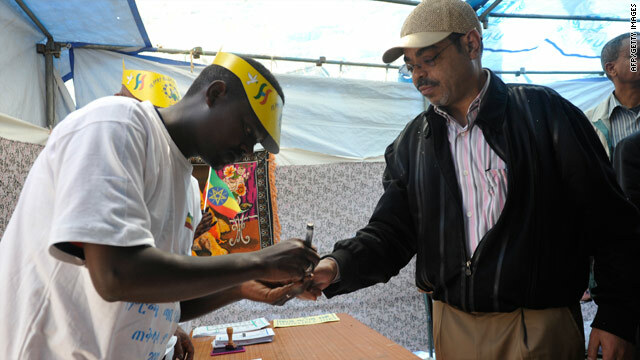 Ethiopian Prime Minister Meles Zenawi has his finger marked after casting his vote in the country's elections on May 23, 2010. PM has accused Voice of America of "engaging in destabilizing propaganda"
(CNN) -- Ethiopians went to the polls Sunday in an election analysts say will likely return the prime minister back into power after more than a decade leading the Horn of Africa nation. Prime Minister Meles Zenawi is a major western ally who has helped battle Islamic rebels in the region. Ethiopia neighbors volatile Sudan and Somalia, the latter mired in violence as al-Shabaab militants demand a stricter form of Islamic law. The opposition decried Ethiopia's last election in 2005 as rigged, and has said it does not expect Sunday's poll to be any better. New York-based Human Rights accused the Ethiopian government of "waging a coordinated and sustained attack on political opponents, journalists, and rights activists" ahead of the elections." "Expressing dissent is very dangerous in Ethiopia," said Georgette Gagnon, Africa director at Human Rights Watch. "The ruling party and the state are becoming one, and the government is using the full weight of its power to eliminate opposition and intimidate people into silence." Scores of citizens were arrested in 2005 after they challenged the vote that favored Zenawi and his party, the Ethiopian People's Revolutionary Democratic Front. European Union observes said it fell "short of international principles for genuine" democracy. "The counting and aggregation processes were marred by irregular practices, confusion and a lack of transparency," the observers said in a report. "The human rights situation rapidly deteriorated in the postelection day period when dozens of citizens were killed by the police and thousands were arrested." Despite the criticism, Zenawi's government has battled challenges such as drought and border clashes with Eritrea. The nation sent its troops to neighboring Somalia a few years ago to support the overwhelmed interim government in its fight against Islamist insurgents. However, rights groups have accused Zenawi of stifling dissent and silencing the media leading up to the election. In March, American officials condemned plans by the prime minister to block U.S.-funded Voice of America broadcasts in Amharic, the main local language. Zenawi accused the media organization of "engaging in destabilizing propaganda" at the time and compared it to a Rwandan radio station accused of stoking the 1994 genocide that killed about 800,000 people. Press freedom activists have accused Ethiopia of trying to limit media coverage leading up to the elections, which the government denies. Zenawi's party has ruled the second-most populous nation in Africa since 1991.